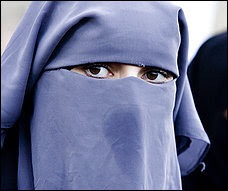 Belgian lawmakers on Thursday passed a nationwide ban prohibiting women from wearing full-face Islamic veils in public places, the first move of its kind in Western Europe. The unanimous vote in the lower house of Parliament came in response to growing irritation in Belgium and other West European countries over the increasing numbers and visibility of Muslims whose customs and attitudes often present a challenge to the continent's largely Christian heritage. The French government, after months of rancorous debate, has pledged to pass a similar nationwide ban by September, a promise denounced by Muslims as "stigmatization" of their religion. Swiss voters, in a referendum in December, barred Muslims from building minarets, or towers, to call the faithful to prayer. Their vote, widely decried as anti-Islamic by Muslim and human rights groups, generated favorable comment from conservative French politicians along with suggestions that France should impose a similar minaret ban. GOP hopes to win 3 symbolic seats: "I call them the trophy seats," said Sen. John Cornyn (Tex. ), who heads the National Republican Senatorial Comm. 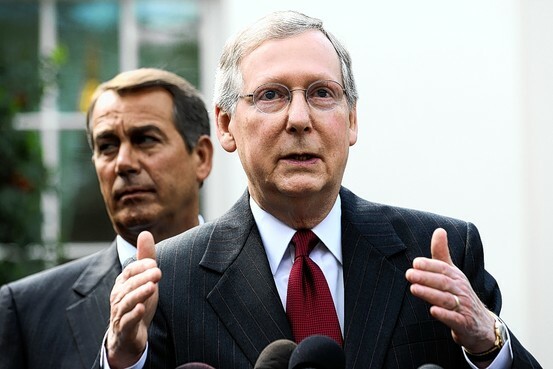 This year, Republicans are looking to hit the trifecta in the Senate. As things stand now, they are well within striking distance of winning President Obama's old seat in Illinois and Vice President Biden's former perch in Delaware, and of toppling Majority Leader Harry M. Reid in Nevada. "I call them the trophy seats," said Sen. John Cornyn (Tex. 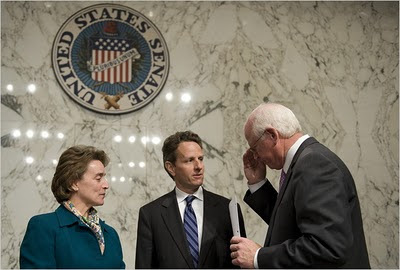 ), who heads the National Republican Senatorial Committee. Winning all three would affirm a GOP resurgence and announce -- as Scott Brown did, when he won a January special election for the late Edward M. Kennedy's Senate seat in Massachusetts -- that Democrats aren't safe anywhere anymore. As is the case pretty much everywhere in the country, Republican candidates in Cornyn's three "trophy" races are the beneficiaries of a sour national mood. But Illinois, Delaware and Nevada also present unique sets of problems for the Democrats. For 2 Parties, Immigration Poses Complex Test -- Despite recent talk, it appears unlikely that Congress will act this election year. This week, Senator Harry Reid of Nevada, the Democratic majority leader, abruptly announced that the Senate would take up an immigration bill to address both enhanced border security and citizenship, even in the face of daunting odds. Mr. Reid also faces a tough re-election battle, and his advisers believe that Hispanic voters in Nevada could prove key to his re-election. In the short term, Mr. Reid’s vow to tackle immigration legislation this year could hurt some Democrats in the fall elections, causing problems with voters who view immigrants as competition for tough-to-find jobs and illegal immigration as a drain on social services, analysts from both parties said. That could especially be a problem for first- and second-term Democrats representing blue-collar states particularly hard hit by the recession. But the Republican Party could face long-term risks if it is identified with legislation cracking down on illegal immigration at a time when Hispanic voters are emerging as an increasingly large and engaged part of the American electorate. The Arizona law has enraged many Hispanic groups, who see it as a form of racial profiling. “Immigration is the most explosive issue I’ve seen in my political career,” said Mark McKinnon, who was a senior adviser both to Mr. McCain and to President George W. Bush, who also supported giving illegal immigrants a path to citizenship. “This is an issue on which Republicans salivate over short-term gains without much thought to the longer-term damage it will do the party,” Mr. McKinnon said. For all the recent talk about moving ahead on an immigration bill, it appears unlikely that Congress will act this year, especially since no Senate Republican now seems willing to work with the White House on the issue. Senate Majority Leader Harry M. Reid backed off Tuesday from his pledge to fast-track an overhaul of the nation's immigration laws, after fellow Democrats voiced skepticism and a key Republican supporter [Sen. Lindsey O. Graham (S.C.)] abandoned the effort. For years Arizonans have implored federal officials to do something about immigration reform and border control -- to no avail. Let me interrupt this tirade to point out that while Arizona has unquestionably done the wrong thing, it is understandable that exasperated officials believed they had to do something. Immigration policy and border security are federal responsibilities, and Washington has failed miserably to address what Arizonans legitimately see as a crisis. Arizona has become the preferred point of entry for undocumented workers, and an estimated 460,000 are in the state -- settling down, or just passing through -- at any given time. I have driven down to the border and watched as authorities tried to pick out trucks and vans that might be transporting people without papers. I've spent a morning at the Mexican consulate in Phoenix, which is usually crowded with recent immigrants; only the most naive observer would think that all or even most of them were in the country legally. The influx imposes an unfair burden on the state, and for years Arizonans have implored federal officials to do something about immigration reform and border control -- to no avail. President Obama is correct: It would be better to have an immigration policy enforced at the federal level, rather than a patchwork of state measures such as the one Arizona just signed into law. The problem is, the nation has an official national immigration policy (come here legally or you're not welcome), it's just that there has been no political backbone to enforce it from the federal level. The result? Porous borders. And, forcing states to do the best they can with what they've got. Mr. Obama called the Arizona law "misguided" and instructed his attorney general to investigate the state measure to see if it is constitutional. That's the wrong response. After all, it is the decades-long de facto policy of ignoring border security that is misguided. In reference to the Arizona measure giving local and state authorities the power to arrest illegal immigrants, Mr. Obama said a national policy is needed in order to preclude "irresponsibility by others." But it is irresponsibility on the part of Washington that has necessitated action by the states. Arizona has at least 460,000 illegal immigrants; states such as California have many more. Most of these individuals likely crossed the border simply to escape poverty and find work, and you can't blame them. But in doing so, they jumped ahead of the line of those who put in the time and effort to follow the law. What's more, not all illegal immigration is benign. The cancer of Mexican drug cartel violence has begun to metastasize into U.S. border states. Violent drug gangs have begun to put hits out on rivals and even law enforcement officials within the United States. Detractors cry that the Arizona law will lead to racial profiling. That's a concern. But the law specifically prohibits race and nationality as sole reasons for immigration checks. A more reasonable concern is that illegal immigrants are often the victims of crime, and making their status punishable within the state will reduce their willingness to report crimes or assist law enforcement in solving them. That's been a problem in Savannah and Chatham County, where Hispanics have been the targets of armed robberies. But again, Washington is at fault. You can't blame states for trying to pick up the pieces as best they can. Presidential commission to address rising national debt -- The public debt will hit 90 percent of the economy by 2020. A presidential commission will convene Tuesday at the White House to address what leaders of both parties agree is one of the greatest threats to the country's economic future: the rising national debt. Official forecasts suggest that without sharp changes in federal spending or tax collections, the United States could enter into a downward spiral of indebtedness that by the end of this decade would erode the country's ability to educate its children, care for the elderly or mount a robust national defense. At the very least, the Commission on Fiscal Responsibility and Reform will mark the beginning of a national conversation about the role of government in American society. Social Security, Medicare and Medicaid -- popular programs that guarantee income support and universal health coverage to people older than 65 -- are growing faster than tax revenue as medical costs rise and the population ages. In the coming decades, the three programs are forecast to dwarf all other spending and force the Treasury to borrow to keep them afloat. That crisis seemed distant until the recession hit, causing tax collections to tank and federal spending to increase as policymakers scrambled to avert an economic collapse. The public debt is forecast to rise from less than 40 percent of the economy to more than 60 percent by the end of this year, its highest level since 1952. The debt will hit 90 percent by 2020 under President Obama's budget, according to the nonpartisan Congressional Budget Office, a level last seen in the aftermath of World War II. Meanwhile, the CBO forecasts that interest payments will rise from less than $200 billion a year to more than $900 billion. At that level, debt service would eat up nearly 20 percent of all federal spending, according to the CBO, and more than 4.5 percent of the economy -- the highest level since the government began tracking net interest payments in 1962. "We're facing a situation that is far worse than we've ever seen in the past," said Charles Konigsberg, director of a separate debt-reduction task force at the Bipartisan Policy Center. "The last time the debt was this high was at the end of World War II. But then we owed the debt to ourselves. Now those interest payments are flowing out of the country" to China and other foreign investors. "Greece is sinking on debt and deficit. Spain's next, Portugal's next. How'd you like to be the United States of America when China pulls the tin cup and says, 'We don't want T-bills, we want money'?" commission co-chairman Alan K. Simpson, a former GOP senator from Wyoming, said on "Fox News Sunday." "Now, that's where we are. This is serious business." The thrill of victory . . . and the agony of defeat -- Kudos to Reed who 'put his personal political reputation on the line' with transportation bill. After four years of effort, our Republican-controlled Legislature last week passed a transportation funding bill. As if it were a billion-dollar kidney stone. Sweat-stained relief, rather than elation, is the dominant emotion at the state Capitol. The margin of victory on Wednesday, 43-8 in the Senate and 141-29 in the House, belies the pain and drama of the delivery. Republicans and business leaders give Atlanta Mayor Kasim Reed much of the credit for passage of HB 277. The former state lawmaker crossed the street from City Hall and broke through a wall of opposition thrown up by his fellow Democrats. It was by far the riskiest move of his early mayoral career. “I think he put his personal political reputation on the line with Democrats who thought the bill was not enough,” said Sam Williams, president of the Metro Chamber of Commerce. [T]he MARTA component of HB 277 . . . threatened to torpedo the bill — there is nothing like transportation to bring out the crippling hostilities of race and region in the South. [Many Democratic lawmakers] wondered why Reed would allow the GOP to paper over its neglect of transportation funding so close to November. “No one deserves an outsized share of the credit,” Reed said in a Friday telephone interview. 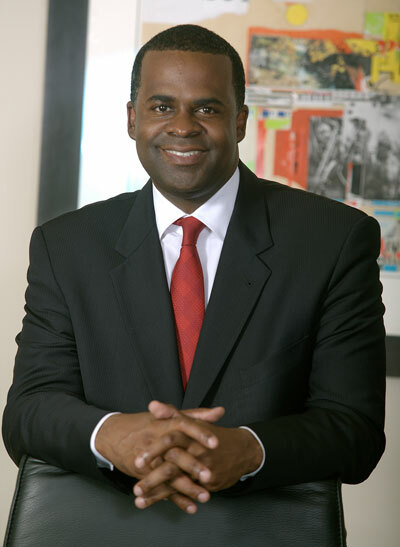 The mayor said he was most concerned with metro Atlanta’s business reputation — and the gains that have been made in Dallas/Fort Worth and Charlotte. “Four years of failure are hard to explain in that kind of competitive environment,” Reed said. See Political Insider update here. In a move that may derail a comprehensive climate change and energy bill in the Senate, one of the measure’s central architects, Senator Lindsey Graham, has issued an angry protest over what he says are Democratic plans to give priority to a debate over immigration policy. [T]hat Mr. Obey here in Wisconsin and other veteran lawmakers . . . suddenly find themselves in a fight reflects an increasingly sour mood toward the Democratic Party and incumbents. Health Care Cost Increase Is Projected for New Law -- Medicaid recipients will increase by 20 million to a total of 84 million (84 million; wow!!). The government will spend $828 billion to expand insurance coverage over the next 10 years. Expansion of Medicaid accounts for about half of the cost. The number of Medicaid recipients will increase by 20 million, to a total of 84 million in 2019. In these columns I try to give voice to a philosophy you might call progressive conservatism. It starts with the wisdom of Edmund Burke — the belief that the world is more complex than we can know and we should be skeptical of handing too much power to government planners. It layers in a dose of Hamiltonian optimism — the belief that limited but energetic government can nonetheless successfully enhance opportunity and social mobility. This general philosophy puts me to the left of where the Republican Party is now, and to the right of the Democratic Party. It puts me in that silly spot on the political map, the center, or a step to the right of it. The center has been losing political power pretty much my entire career. But I confess that about 16 months ago I had some hope of a revival. The culture war, which had bitterly divided the country for decades, was winding down. The war war — the fight over Iraq and national security — was also waning. The country had just elected a man who vowed to move past the old polarities, who valued discussion and who clearly had some sympathy with both the Burkean and Hamiltonian impulses. He staffed his administration with brilliant pragmatists whose views overlapped with mine, who differed only in that they have more faith in technocratic planning. Yet things have not worked out for those of us in the broad middle. Politics is more polarized than ever. The two parties have drifted further to the extremes. The center is drained and depressed. History happened. The administration came into power at a time of economic crisis. This led it, in the first bloom of self-confidence, to attempt many big projects all at once. Each of these projects may have been defensible in isolation, but in combination they created the impression of a federal onslaught. One of the odd features of the Democratic Party is its inability to learn what politics is about. It’s not about winning arguments. It’s about deciding which arguments you are going to have. In the first year of the Obama administration, the Democrats, either wittingly or unwittingly, decided to put the big government-versus-small government debate at the center of American life. As government grew, the antigovernment right mobilized. This produced the Tea Party Movement — a characteristically raw but authentically American revolt led by members of the yeoman enterprising class. As government grew, many moderates and independents (not always the same thing) recoiled in alarm. In 2008, the country was evenly split on whether there should be bigger government with more services or smaller government with fewer services. Now, according to a Pew Research Center poll, the smaller government side has a 10-point edge. Since President Obama’s inauguration, the share of Americans who call themselves liberals (24 percent) has remained flat, but the share who call themselves conservatives (42 percent) has risen by as much as 10 percentage points, according to a Washington Post/ABC News poll, as former moderates have shifted to the antigovernment side. As government has seemed more threatening, moderates and independents have also fled from the Democratic Party. Democratic favorability ratings have dropped by 21 points over the past year, from 59 percent to 38 percent. Democrats are viewed less favorably than at any time in modern history. These shifts in the electorate have had predictable effects on the two parties. During periods when the government war is at full swing, the libertarian/Goldwater-esque tendency in the Republican Party becomes dominant and all other tendencies become dormant. That has happened now. During periods of government war, the Democratic Party also reverts to its vestigial self. Democrats don’t want to defend big government, so instead they lash out at business. Over the past weeks, President Obama has upped his attacks on Big Oil, Wall Street and “powerful interests,” sounding like an orthodox Reagan-era Democrat. The government war is playing out just as you’d expect it to, strengthening those with pure positions and leaving those of us in the middle in the cross-fire. If the debate were about how to increase productivity or improve living standards, people like me could play. But when the country is wrapped up in a theological debate about the size of government, people like me are stuck crossways, trying to make distinctions no one heeds. This is a disappointing time. The Democrats have become the government party and the Republicans are the small government party. The stale, old debate is back with a fury. The war, as always, takes control. Congressional Republicans are enthusiastic about their performance in the all-important midterm money chase. But the Democratic House and Senate campaign committees still managed to out-raise the Republican organizations last month and have more cash in the bank even though Republicans claim the momentum. According to party figures, the Democratic Congressional Campaign Committee raised nearly $10 million in March compared with $8 million for the National Republican Congressional Committee. House Democrats ended the first quarter with $26 million in the bank compared with $10 million for House Republicans. In the Senate, the Democratic Senatorial Campaign Committee raised $6 million and had $17 million in the bank, while the National Republican Senatorial Committee took in $5.1 million and had $15 million available to spend. House Democrats attributed their success to party members energized by the health care legislation. One area where Democrats lag is in contributions from House members. Many Democrats have their own contests and cannot easily spare the cash. [There is a trend of creating "racially identifiable" schools leading toward] racial isolation that has been underway for years in American schools and has undermined the historic school integration efforts of the civil rights era. More than half a century after courts dismantled the legal framework that enforced segregation, Obama administration officials are investigating an array of practices across the country that contribute to a present-day version that they say is no less insidious. Although minority students have the legal right to attend any school, federal officials are questioning whether in practice many receive less access than white students to the best teachers, college prep courses and other resources. Department of Education lawyers also are investigating whether minority students are being separated into special education classes without justification, whether they are being disciplined more harshly and whether districts are failing to provide adequate English language programs for students who are not fluent, among other issues. The Senate Agriculture Committee, more used to dealing with farm subsidies than Wall Street, has drawn enormous interest from lobbyists and donors. Timothy Geithner, center, Treasury secretary, with Senators Blanche Lincoln and Saxby Chambliss of the Agriculture Committee. Assessing the battle to overhaul the nation’s financial regulations recently, Jamie Dimon, the chief executive of JPMorgan Chase, left no doubt about the consequences if Congress cracked down on his bank’s immense business in derivatives. The forum for all this attention is not the usual banking and financial services committees, but rather the Senate Agriculture Committee, a group more accustomed to dealing with farm subsidies and national forest boundaries than with the more obscure corners of Wall Street. The committee will be the main arena for the derivatives fight for reasons dating to an era when farming was more important to the nation’s economy than finance. In their simplest form, derivatives can provide financial protection on the value of an investment or commodity. For example, by putting up a relatively small amount of money, a farmer could buy a derivative known as a forward or futures contract that would guarantee a set price for crops and thereby guard against ruinous price swings between planting and harvest. But the most esoteric derivatives — which also are the most profitable for banks to create and trade — have little economic purpose other than to let investors place financial bets, critics say. A more complex type of derivative helped to inflate the housing bubble in recent years, as Wall Street repackaged high-risk mortgages into securities that speculators could use to bet on the direction of the housing market. Financial institutions earned millions of dollars in fees for creating the securities. But many of the derivatives became worthless when foreclosures skyrocketed, leading to billions of dollars of losses — and taxpayer bailouts — at the banks and insurance companies that owned them. Now, these obscure and largely unregulated securities — more than $600 trillion of which are tucked into investors’ portfolios, according to the Treasury Department — are at the center of the fight over financial reform led by the Obama administration. No one has heard anything from Rep. Calvin Smyre I assume. [M]y favorite low profile political trio – Labor Commissioner Michael Thurmond, Attorney General Thurbert Baker and former state Democratic Party Chairman Calvin Smyre – remain most vigilant in rebuilding our state's white-black Democratic coalition as we all work together in reviving the crumbled Democratic power and putting back together again our Humpty-Dumpty Democratic Party of Georgia following our November 2002 whipping. With Thurbert Baker announcing his run for governor a year ago and Michael Thurmond expected to announce a challenge to Sen. Isakson later this week, I need to revise my above-quoted description. The words "favorite" and "trio" remain accurate and intact. But I am going to abandon the "low profile" part. (1) Galloway knocks another one out of the ballpark: 'Behind Michael Thurmond’s run for the U.S. Senate' & (2) What will Thurbert say? “The last thing that the Georgia Democratic party needs is at this point in time is an extensive, controversial and divisive primary season, especially in the governor’s race,” said state Labor Commissioner Michael Thurmond, who is also vice-chairman of the party. With Michael Thurmond publicly commenting on a decision by Thurbert Baker to run for a different office, I am wondering if we should expect the Attorney General to reciprocate. This could be interesting as I assume that the Attorney General would be among "the essential stage hands of the state Democratic party" referred to in Jim Galloway's article below. Michael Thurmond, known as one of the most cautious men in Georgia politics, spent the weekend on the phone with the essential stage hands of the state Democratic party, explaining the gamble he’s about to take. three-term state labor commissioner has plans on Wednesday – moved from Tuesday, as first reported — to announce his U.S. Senate candidacy against Republican incumbent Johnny Isakson. Consider that Thurmond is, like Attorney General Thurbert Baker or former Gov. Roy Barnes, an A-list Democrat – often mentioned as a candidate for higher office, but never taking the plunge. Also consider that Isakson may be the strongest and most popular Republican in Georgia. So the question becomes whether Thurmond, a former state lawmaker from Athens, has been hiding a passion for the roulette wheel. Thurmond is better than good on the stump, and has a friendly demeanor that goes down well with voters. But he’s enough of a politician to understand the risk. There are always unknowns. Isakson, 65, has had some health issues this spring. Polling has shown some vulnerability. And while the tea party movement has added emotion to the Republican side of the ledger, it’s also added a certain brittleness. But the known knowns, as Donald Rumsfeld might say, include this: Isakson has raised $6 million for his re-election bid. And a contest against him is an uphill slog by any measure. So what, short of outright victory in November, is Thurmond up to? Politics is very rarely a team sport – but we may be seeing the equivalent of a sacrifice fly to deep right field, for the sake of advancing or protecting the Democratic runners already on base. Thurmond is a sign that Democrats in Georgia and in Washington, with reapportionment coming next year, are dead serious about November. Point One: All four major Democratic candidates for governor are casting Republican ineptitude in the state Capitol as the issue that will carry them into the general election. The GOP, on the other hand, will do its best to tie Democrats to Washington and President Barack Obama, who does not poll well here in Georgia. Not among white independents. The economy will be the topic. Isakson would be a major vehicle for nationalizing the Georgia contest. If the GOP incumbent, at the top of the ballot, clears much beyond 60 percent, strategists figure then Democratic chances of winning the race for governor disappear. Whether the candidate is Barnes, Baker, DuBose Porter or David Poythress. And right now, the only Democrat in the Senate race is the unknown and unfunded R.J. Hadley. By putting up an A-list candidate fluent in the language of jobs and the economy, who just happens to be African-American, Democrats will be taking a large step toward preventing an Isakson-driven avalanche. And remember that no one anticipated the September ‘08 economic bust that forced a runoff between Saxby Chambliss and Jim Martin. Point Two: Thurmond had been spoken of as a candidate for lieutenant governor. But Carol Porter, wife of the Democratic candidate for governor, jumped in first. Arguably, Thurmond might have beaten Carol Porter, but at the cost of a divided Democratic electorate that still bears the scars of the Cathy Cox/Mark Taylor debacle. Thurmond’s shift to the U.S. Senate race in essence hands Carol Porter the Democratic nomination for a post that has never gone to a woman. Carol Porter could be the highest-ranking woman in state government. Which means the contest against Republican incumbent Casey Cagle is sure to generate interest through November. 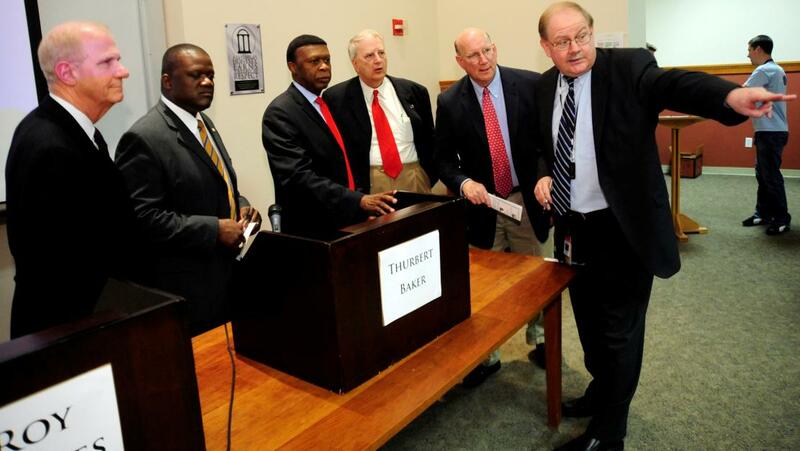 Moreover, let’s suppose that DuBose Porter does not win the Democratic contest for governor. By assuring Carol Porter’s nomination for lieutenant governor, you guarantee that the House Democratic leader will remain engaged. Point three: In the Democratic race for governor, Thurmond’s entrance as a U.S. Senate candidate is likely to benefit Barnes. Baker, while he has differed with other African-Americans in the party over such volatile issues as Genarlow Wilson, has a legitimate claim on black voters. Barnes likewise has a claim on African-American voters, through his decision to change the ‘56 state flag. But with Thurmond at the top of the state ballot, racial loyalty immediately becomes a lesser issue. And if Barnes is indeed the Democratic nominee, the chances of an African-American backlash are greatly lessened. I’m sure there are other advantages/disadvantages. Feel free to add them below. But bottom line, if Thurmond joins the U.S. Senate race, then — win or lose — should any Democrat win a statewide contest in November, he’ll deserve a spot on the stage. Earlier polls notwithstanding, it has always been my sense that the predictions of her demise, at least in the Democratic primary, were premature. When Arkansas Lt. Gov. 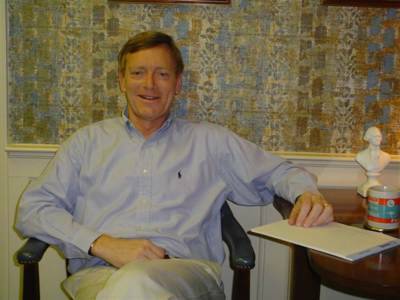 Bill Halter announced on March 1 that he would enter the Democratic primary against Sen. Blanche Lincoln, many political observers viewed it as the beginning of the end for the incumbent. Instead, the announcement may have marked the start of her political comeback. Before Halter's candidacy, which had been discussed for months in Democratic political circles in the state, Lincoln's reelection campaign seemed moribund. She had come under withering criticism from both the right and the left for her role (or lack thereof) in the health-care debate, and her campaign seemed to reflect that stuck-in-neutral mentality. A recent Research 2000 survey sponsored by the liberal Daily Kos blog (its founder, Markos Moulitsas, is a Halter supporter), showed Lincoln leading Halter by 45 percent to 33 percent, a margin virtually unchanged from a poll done for the blog three weeks earlier. Three days after Halter made it official, however, Lincoln launched television ads touting her Senate seniority (she is the first Arkansan to chair the Agriculture Committee) and casting herself as an independent. One ad included a defiant message for the left, which had begun pouring money into Halter's campaign: "I don't answer to my party," she said. "I answer to Arkansas." Suddenly, Lincoln was relevant again. And, polling suggests that despite Halter's eye-popping fundraising and a slew of national labor groups spending money to bash her, Lincoln is holding steady in advance of the May 18 primary. Republicans are turning their political momentum into money in the bank. GOP candidates are starting to catch up to their Democratic opponents in fund-raising efforts and have pulled ahead in some key races, finance reports for the first three months of the election year show. The reports, filed with the Federal Election Commission before a Thursday deadline, offer evidence the GOP is heading into election season with the tools to make big gains in Congress. Republican voters are far more enthusiastic about going to the polls this fall than are Democrats, and the GOP recently took a rare lead in Gallup's so called generic ballot, which asks voters which party should win in their district. In the nine most competitive Senate races, the reports show Republican candidates, as a group, ahead of Democrats during the January-to-March period, according to a Wall Street Journal analysis. That marks a reversal from 2009, when Democrats held the financial advantage in those races. The reports also show that some Republicans who are trying to do one of the toughest things in American politics—oust a sitting member of the House—have found they can get financial backing to do so. Democrats have nearly seven months and several important tools to change the dynamic. In Congress, they have pursued policies that seek to show they are challenging Wall Street, insurance companies and other big interests on behalf of consumers. The party is promoting the health-care law it enacted after a year-long struggle, and is aiming for new regulation of the financial services sector this year. Several surveys have shown that GOP voters are far more motivated to cast ballots this fall than are Democratic voters. The "enthusiasm gap'' between the parties was 21 percentage points in a March Wall Street Journal/NBC survey. And the GOP now leads the Democratic Party on Gallup's "generic'' ballot, which asks voters which party should win in their district, without listing candidate names. Republicans led 48% to 44% in that survey during the week ending April 11, the third week since Congress passed the health care law that the party tied or led the Democrats. Republican Quandary: Is 'No' Still the Way to Go? -- In U.S. politics the two parties take turns overplaying their hands. Being "the party of no" has worked out quite nicely for Republicans, but that position is about to undergo its own stress test. By linking arms to oppose the recently passed health-care overhaul and the economic-stimulus package before that, Republicans have been rewarded with higher approval ratings and enhanced midterm-election prospects. In fact, Sarah Palin last week declared that, rather than shrink from the party-of-no label that Democrats have slapped on them, Republicans should wear it as a badge of honor: "We're the party of hell no," she declared to a gathering of Southern Republicans, who roared their agreement. But just ahead on the road to the 2010 midterm elections lie three big issues—financial regulatory reform, a Supreme Court pick and an arms-reduction treaty—where it's much less clear that presenting a solid wall of opposition to President Barack Obama and his Democrats makes similarly good political sense. The risk for Republicans is that the image they have cultivated as a party taking principled stands can morph—or, more precisely, be morphed by Democrats—into an image of a party of obstructionists. "The people who still decide elections in this country expect progress and don't expect obstruction," says Jim Jordan, a leading Democratic strategist. "This sort of monolithic obstruction to everything just doesn't work with swing voters." Republicans insist they can avoid that trap. "It depends how it's defined," says Republican strategist Frank Luntz. He wrote a memo in January to Republican leaders on the language to use in opposing Democratic bills rewriting the rules of Wall Street regulation that has gone a long way toward framing the party's public posture. On financial regulation, Mr. Luntz argues, the key is to remember that Washington is more loathed than is Wall Street: "The danger for Republicans is to be seen as defending Wall Street," he says. "The danger for Democrats is to be seen as expanding Washington. Right now Democrats are losing their battle." In any case, it's clear the two parties have reached an important inflection point. One way of looking at U.S. politics is to see it as an endless cycle of the two parties taking turns overplaying their hands. It's pretty clear Democrats overplayed their hand after the 2008 election, reading into the results a bigger mandate than they got and paying a price. Now the question is whether Republicans are about to make a similar mistake. The question arises in large measure because two of the issues ahead—ratification of an arms-reduction agreement with Russia and confirmation of a Supreme Court nomination—have traditionally produced shows of bipartisanship. But the most immediate issue is Wall Street regulation, a topic that once seemed more likely to produce consensus rather than the big fight that is developing. Republicans' stated opposition to the Democrats' Senate proposal is that it amounts to a "bailout bill" because a provision allowing the government to oversee the shutdown of big financial firms that hit the rocks will only provide a new safety net for companies making risky investments. Their quieter objection—one harder to sell politically—is that provisions restricting trading in derivatives and establishing a consumer protection agency will handcuff financial markets. Poland buries its President in a funeral that was kind of a reunion of the ex-Soviet bloc, as only those traveling from the East could fly. Ukrainian President Viktor Yanukovych, Lithuanian President Dalia Grybauskaite and Russian President Dmitry Medvedev attended a funeral Mass for the late Polish president and his wife. Volcanic ash kept most Western leaders away from the lavish state funeral of the late Polish President Lech Kaczynski on Sunday, but not Russia President Dmitry Medvedev. The attendance of the Russian president at a funeral filled with Catholic and Polish military pomp underscored Moscow's efforts to improve relations since last Saturday's air disaster. Mr. Kaczynski and 95 others died on April 10, when their plane crashed in thick fog on its approach to Smolensk airport, in western Russia. Nature kept most Western leaders away in the form of volcanic ash from Iceland that closed airspace over Western and Central Europe. That turned the funeral into a kind of reunion of the ex-Soviet bloc, as only those traveling from the East could fly. But the importance of Mr. Medvedev's presence was evident. Leaders from Central Europe . . . made the journey by land, while those from further east were able to fly through still clearer skies. Georgia Democratic gubernatorial candidates David Poythress, Carl Camon, Thurbert Baker, Roy Barnes and DuBose Porter listen intently to the man with the barrel of ink at the Young Democrats of Georgia debate on Saturday at the University of Georgia. Once considered a shoo-in as the next U.S. senator from Florida, Crist's moderate views have made him a target for "tea party" activists and the GOP's right wing. Republican Gov. Charlie Crist, once regarded as a shoo-in to become Florida's next senator, waded into a milling crowd. If his campaign had been going according to plan, the audience here would have been perfect: an elderly, largely conservative throng that included 82-year-old Bob Gammon, who had voted for Crist before and now had a beer in hand and something he wanted to say. Crist smiled and put a campaign sticker on Gammon's Hawaiian shirt. "Oh," Crist said, immediately understanding what Gammon meant. Shortly after Barack Obama's inauguration, the new president had come to Florida to pledge federal help for this economically reeling state -- and Crist had reacted by embracing Obama on stage. "I wish you hadn't hugged him," Gammon said. "I'm glad I did," Crist said calmly, smoothing the sticker on Gammon's shirt. "He was visiting our state. He's the president. I respect the office." "I really wish you hadn't," Gammon said. As he moved away, leaving Crist to answer more questions about the hug, Gammon predicted the outcome of the August Republican primary: "He can't win." If you're Charlie Crist, this is what a political freefall feels like. One day it is 2008, and you're a popular governor whose Republican admirers are talking you up for the veep spot on your party's national ticket. Then, suddenly, you've infuriated party conservatives, what you're being fitted for is a political coffin, and you're deciding whether to leave the GOP and run as an independent. According to polls, Crist was once ahead by about 30 points in a primary contest widely viewed as a certain rout, a steppingstone toward a bigger national stage and a White House run. Now, targeted for extinction by "tea party" activists and the right wing of his party, he is behind by more than 20 points to challenger Marco Rubio. It is yet another reminder of the intraparty dangers awaiting candidates viewed as not conservative enough. From Arizona, where Sen. John McCain faces a tough primary race, to Texas, where Sen. Kay Bailey Hutchison failed in her bid to unseat Gov. Rick Perry, Republicans are also facing an anti-establishment fervor that is threatening once-popular political veterans. Despite his disavowals, speculation persists that Crist might abandon the Republican primary to run as an independent -- the deadline to do it is April 30 -- or drop out of the race. Last week, Crist freshly infuriated Florida conservatives. He voiced uncertainty about a high-profile educational measure that Bush and other Florida conservatives have championed and that Crist once lauded: a state bill designed to tie teacher pay largely to student test scores and to bar tenure for newly hired teachers. The Florida Legislature had approved the bill, and it needed only Crist's signature to become law. But with teachers furiously protesting the measure, Crist suddenly expressed concerns, particularly over how the bill might affect the jobs of teachers instructing disabled children and others with special needs. He said he needed a week to ponder the matter. He eventually vetoed the bill. 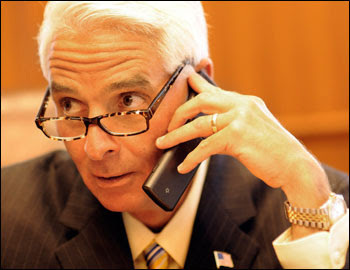 Given Crist's history as a winner and Rubio's untested strength statewide, few analysts are willing to count Crist out. If he launches an independent candidacy, he would be a formidable candidate, according to a Quinnipiac poll. Ahead of him in the next week would be his controversial veto, which would be seen as more evidence of a looming independent candidacy. Ahead also would be an angry backlash from onetime Republican friends, including the abrupt resignation on Thursday of his campaign chairman, former senator Connie Mack, who had mentored Crist since his start in GOP politics. The toughest anti-illegal-immigrant measure in a generation passed the Arizona legislature this week. If signed, as expected, by Republican governor Jan Brewer, the law will give local police sweeping new powers in regard to undocumented workers. Currently, immigration offenses are violations of federal, not state, law, and local police officers only can inquire about a person's immigration status if that person is suspected of another crime. Under SB1070, however, Arizona police will have the right to stop anyone on "reasonable suspicion" that they may be an illegal immigrant and can arrest them if they are not carrying a valid driver's license or identity papers. Passions about illegal immigration run high in Arizona, a point of entry for thousands of undocumented workers going to the U.S. from Mexico, and tensions were heightened by the recent murder of a rancher in a remote border area where illegal crossings are rampant. With 6.6 million residents, Arizona's illegal-immigrant population is estimated to be half a million people. [T]the bill does four things: criminalizes undocumented status, enlists local police in illegal-immigration enforcement, allows citizens to sue police departments if citizens think the police are not being sufficiently vigilant in enforcement and forbids any city from ignoring the state law and becoming a so-called sanctuary zone. Tom Friedman on Afghanistan and Afghan President Hamid Karzai’s corruption. There are many differences between Iraq and Afghanistan, but they do resemble each other in one critical way. In both countries, the “bad guys,” the violent jihadists, are losing. And in both countries, it still is not clear if the “good guys” will really turn out to be good. And the big question the Obama team is facing in both countries is: Should we care? Should we care if these countries are run by decent leaders or by drug-dealing, oil-stealing extras from “The Sopranos” — as long as we can just get out? At this stage, alas, we have to care — and here’s why. This line echoes the realist arguments during the cold war as to why we had to support various tyrants. What mattered inside their countries was not important, the argument went. What mattered is where they lined up outside in our great struggle against Soviet Communism. The Bush team took this kind of “neo-realist” approach to Afghanistan. It had no desire to do state-building there. Once Karzai was installed, President Bush ignored the corruption of Karzai and his cronies. All the Bush team wanted was for Karzai to hold the country together so the U.S. could use it as a base to go after Al Qaeda in Afghanistan and Pakistan. Frankly, this low-key approach made a lot of sense to me because I never thought Afghanistan was that important. But, unfortunately, the Karzai government became so rotten and incapable of delivering services that many Afghans turned back to the Taliban. So the Obama team came with a new strategy: We have to defeat the Taliban in Afghanistan if we are going to keep Al Qaeda in check there and in Pakistan — and the only way to do that is by clearing them out of the towns and installing decent Afghan police, judges and bureaucrats — i.e., good governance — in the Taliban’s wake. Obama’s view is that, to some degree, idealism is the new realism in Afghanistan: To protect our hard-core interests, to achieve even our limited goals of quashing Al Qaeda and its allies, we have to do something that looks very idealistic — deliver better governance for Afghans. I still wish we had opted for a less intrusive alternative; I’m still skeptical about the whole thing. But I understand the logic of the Obama strategy and, given that logic, he was right to chastise Karzai — even publicly. If decent governance is the key to our strategy, it is important that Afghans see and hear where we stand on these issues. Otherwise, where will they find the courage to stand up for better governance? We need to bring along the whole society. Never forget, the Karzai regime’s misgovernance is the reason we’re having to surge anew in Afghanistan. Karzai is both the cause and the beneficiary of the surge. I’m sure the surge will beat the bad guys, but if the “good guys” are no better, it will all be for naught. In the cold war all that mattered was whether a country was allied with us. What matters in Obama’s war in Afghanistan is whether the Afghan people are allied with their own government and each other. Only then can we get out and leave behind something stable, decent and self-sustaining. Unlike Afghanistan, the war in Iraq was, at its core, always driven more by idealism than realism. It was sold as being about W.M.D. But, in truth, it was really a rare exercise in the revolutionary deployment of U.S. power. The immediate target was to topple Saddam’s genocidal dictatorship. But the bigger objective was to help Iraqis midwife a democratic model that could inspire reform across the Arab-Muslim world and give the youth there a chance at a better future. Again, the Iraq story is far from over, but one does have to take heart at the recent elections there and the degree to which Iraqi voters favored multiethnic, modernizing parties. So, while Obama came to office looking at both Iraq and Afghanistan as places where we need to be focused more on protecting our interests than promoting our ideals, he’s finding himself, now in office, having to promote a more idealist approach to both. The world will be a better place if it works, but it will require constant vigilance. When Karzai tries to gut an independent election commission, that matters. When the Iraqi prime minister, Nuri Kamal al-Maliki, refuses to accept a vote count certified by the U.N. that puts him in second place, that matters. As I have said before, friends don’t let friends drive drunk — especially when we’re still in the back seat alongside an infant named Democracy. President Barack Obama has proposed allowing the Bush-era tax cuts to expire for families making more than $250,000, a change that would return their top rates to 39.6% and 36%, lift their capital-gains rate and trim some deductions. Given the still-precarious economy, the coming election and the looming need for a broader look at spending and taxes, it's possible Congress will decide to simply extend some or all the Bush tax cuts for a year or two. And prospects are growing that Congress will punt on the tough tax decisions until after November. But sometime soon after the election, lawmakers will try for a broad bipartisan deal on taxes and spending, perhaps aided by a recently formed fiscal commission. At least some Democrats remain optimistic, despite Republicans' resistance to new taxes and their own members' reluctance to cut entitlements. Republicans complain that already, almost half of American households pay no income tax [the AP reported this week that 47% of Americans pay no income tax], a trend that Rep. Pat Tiberi (R., Ohio) worries will continue. Still, even some Democrats appear to be questioning Mr. Obama's pledge to protect all families making less than $250,000. A mature grown-up, upon losing, shouldn't just take his ball & go home: The Ox has lost it -- Oxendine says no to ‘high-risk' insurance pool for Ga.
Georgia Insurance Commissioner John Oxendine said Monday that his office will not participate in a major first step of the new federal health care law, the creation of state pools that help sick people pay for health insurance. Many sick people cannot afford the costs of such "high-risk" plans, and the new law provides some $5 billion in federal money to help people across the country pay for the insurance premiums. The program is slated to be fully funded by the federal government, with no state costs. The "high-risk" pools are considered a stopgap measure to help people until the federal government greatly expands the eligibility for Medicaid in 2014. People would have to have been uninsured for six months to apply for the money. His decision will not affect the cost of insurance for any patients, but it means that the federal government, not the state, will oversee the distribution of certain federal health care funds in Georgia. Mr. Oxendine said his opposition to the pool program was legal and financial, not politically motivated. But some political experts noted that any stance against the federal health care law could help him in the crowded Republican primary race for governor in July. The year was 1994. Congressional Democrats were battered after a failed fight to pass a health care bill. It was the first midterm election for a new Democratic president, Bill Clinton. By overwhelming numbers, Americans thought the country was heading in the wrong direction, had unfavorable views of the president and Congress, and said it was time for new leadership in Washington. That fall, Republicans swept to power, capturing 9 seats in the Senate and 52 in the House. In many ways, the 1994 election has become the template both Republicans and Democrats are looking to as they set their strategies for the fall Congressional elections. Democratic campaign operatives, who are girding for big losses, began meeting quietly with party strategists involved in the 1994 contests last summer, looking for lessons on how to avoid another rout. Yet 1994 seems an imprecise way to predict how this contest will play out. While there are intriguing parallels, there are some important differences as well. And though Democrats might look to those differences as glimmers of light — “There are so many things different from ’94 that I think this will turn out very differently,” said Stanley Greenberg, who was the White House pollster in 1994 — the divergences seem as likely to benefit Republicans as Democrats, analysts in both parties said. Further, it seems too early to measure the effect of what is perhaps the biggest difference between the two cycles — that Democrats this time succeeded in passing a major health care bill. For Democrats, the biggest obstacle appears to be that they are once again working in the kind of environment that has historically proved toxic to the party in power. Mr. Obama’s favorability ratings, like Mr. Clinton’s in 1994, have slipped below 50 percent, almost invariably a bad harbinger for the party in power in midterm elections. Congress and the Democratic Party are today extremely unpopular, as they were in 1994. [I]n some ways, Republicans seem even better positioned than they were in 1994. Republican voters appear highly energized by the health care bill, and that kind of voter interest typically results in significant turnout in a midterm election. Many experts have predicted big gains for Republicans — even some Democrats say Republicans might win 40 seats and thus control of the House — making it easier for the Republican Party to recruit candidates who might otherwise have stood aside. It could also make it easier for the party to raise money and enliven supporters. In 1994, Democrats had 28 retirements, putting many districts on the table that otherwise would have been safe. Last week, Representative Bart Stupak of Michigan announced that he would not seek re-election, pushing the number of Democrats who are retiring this year to 20, equal to the number of Republicans who are retiring. The number is still relatively low, though not as low as Democrats would have liked. With every passing day, it is becoming clearer that next year the issue of paying for the government will be back at the center of political debate. On Wednesday in Dallas, Ben Bernanke . . . said: "Inevitably, addressing the fiscal challenges posed by an aging population will require a willingness to make difficult choices. The arithmetic is, unfortunately, quite clear. To avoid large and unsustainable budget deficits, the nation will ultimately have to choose among higher taxes, modifications to entitlement programs such as Social Security and Medicare, less spending on everything else from education to defense, or some combination of the above." The next day, at a breakfast with reporters in Washington, Douglas Elmendorf, the head of the Congressional Budget Office, confirmed that his economists have begun studying how to write a value-added tax, a form of national sales tax, because of growing congressional interest in drafting such a measure. In Kentucky, the Tea Party movement, with the voter discontent it has captured, has found its purest standard bearer in Dr. Rand Paul. The Tea Party movement may aid Dr. Rand Paul in his bid for Kentucky’s open Senate seat. [I]n Kentucky, the Tea Party movement, with the voter discontent it has captured, has found its purest standard bearer in Rand Paul, who is challenging Mr. [Trey Grayson, Secretary of State,] for the Republican nomination. An ophthalmologist, Dr. Paul is the son of Representative Ron Paul of Texas, the 2008 Republican presidential candidate whose libertarian backers often take credit for being the germ of the Tea Party. The prospect of a Paul victory scares some Republicans. Charlie Cook, a nonpartisan political forecaster, and some of Mr. Grayson’s backers here say that if Dr. Paul wins the primary, Republicans could lose the seat in November — proving that Tea Party energy, generally thought to benefit Republicans, can hurt them, too. Dr. Paul, who has been endorsed by Sarah Palin, is met at each stop by local Tea Party groups with “Don’t Tread on Me” flags, who ask him how to reverse the health care bill, reduce the debt and bring back jobs. For Mr. Grayson, there is irony in the challenge. Mr. [Mitch McConnell, a powerful backer and Kentucky’s senior senator and the Senate’s highest ranking Republican,] and his allies had feared that the sitting senator, Jim Bunning, would not win, so they nudged him out last summer after securing another Republican, Mr. Grayson, who was sure to win the seat. Rep. Bart Stupak, the Michigan Democrat at the center of a furor over abortion coverage in the new health law. This comes as absolutely no surprise whatsoever to me. The congressman, after obtaining his high profile status during the health care debate, got himself into a no win situation, regardless of how things played themselves out. The only possible way it could have had a different ending (short of his running and winning reelection), it appears to me, is if his group had not been the final votes insuring passage. But when they were, he immediately became vilified by both sides, the abortion-rights community as well as the anti-abortion activists who considered him a traitor who caved to Pelosi at the last minute. According to The Wall Street Journal, many political analysts believe he would have prevailed in both a primary and a general election fight, but the fight was likely to be contentious. 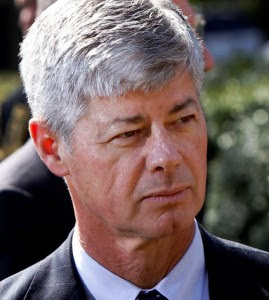 Representative Bart Stupak of Michigan, who played a central role with fellow anti-abortion Democrats in negotiating a compromise in the final hours of debate that allowed the health care overhaul bill to pass, said on Friday that he would not seek re-election. Mr. Stupak, a nine-term incumbent, has been under intense pressure from anti-abortion groups and others since the health care bill passed last month. His decision to not seek re-election sent a fresh wave of anxiety through the Democratic Party, narrowing their margin for error as they fight with Republicans for control of the House in the midterm elections. Republicans in Michigan and Washington seized on the departure of Mr. Stupak as an opportunity to improve their chances for control of the House. Mr. Stupak, a leader of the Congressional Pro-life Caucus, put himself at the center of a debate over provisions in the big health care legislation regarding insurance coverage for abortions. In the fall, Mr. Stupak pulled off what at the time seemed a remarkable political feat, forcing Ms. Pelosi, who is a fierce champion of abortion rights, and other liberal Democrats to allow a vote on an amendment inserting tight restrictions on abortion coverage into the House health care bill. His name became capitol shorthand for the amendment. With Republican support, the amendment was approved, immediately creating a challenge for Democrats in the Senate. Negotiations there between two abortion foes, Senators Ben Nelson of Nebraska and Bob Casey of Pennsylvania, and a supporter of abortion rights, Senator Barbara Boxer of California, produced compromise language for the Senate bill, but when it returned to the House, Mr. Stupak insisted that the Senate language was not good enough, infuriating all sides. Whether they were for or against abortion rights, many Democrats seemed to become anti-Stupak. 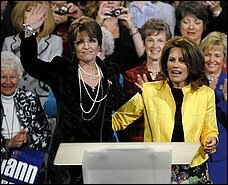 Former Alaska governor Sarah Palin, left, and Rep. Michele Bachmann (R-Minn.) took turns bashing President Obama and congressional Democrats at a campaign rally in Minneapolis. 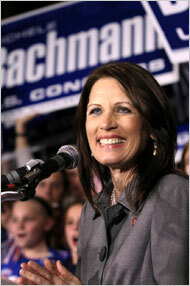 Top photo of Bachmann is from a 10-15-09 post. A 10-15-09 post was entitled "G.O.P. Has a Lightning Rod, and It’s Not Palin." Sen. Isakson will run again. But the truly fascinating question isn't whether Thurmond would run, but which Republican would if Isakson did not. 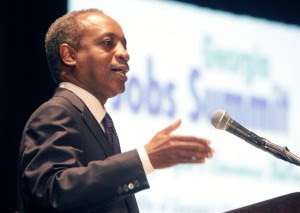 Labor Commissioner Michael Thurmond has toyed with the idea of running for lieutenant governor for several months now but has still not announced whether he will actually run for that office. Thurmond’s silence has already drawn one Democratic candidate into the race for the state’s second highest office: Carol Porter, a Dublin newspaper executive and the wife of gubernatorial candidate DuBose Porter. Thurmond is an eloquent campaigner who’s already won three statewide races for labor commissioner and would be a very credible candidate for lieutenant governor. If U.S. Sen. Johnny Isakson, who’s now been hospitalized twice in a two-week period, turns out to have health issues that prevent him from running for another term, Thurmond would be a strong contender for that seat. The issue with Thurmond, as always, lies in getting him to make a decision. If I were a betting man, I'd put my money on Thurmond staying home and running for a fourth term as labor commissioner. We’ll find out for sure during the week of April 26. On April 18 . . . the last sardine cannery in the United States [in Prospect Harbor, Maine] is shutting down. 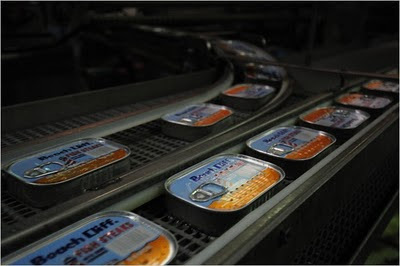 Once a thriving national industry — and the backdrop of John Steinbeck’s gritty “Cannery Row” — sardine canneries have been dwindling for the last half-century. They have fallen victim to global competition, corporate consolidations and a general lack of appetite, at least in the United States, for sardines, despite their nutritional value and attempts by chefs to give them an image makeover. President Hamid Karzai on Thursday delivered one of his most stinging criticisms to date of the foreign presence in Afghanistan, accusing the West and the United Nations of wanting a "puppet government" and of orchestrating fraud in last year's election. Karzai's criticism provides a new indication of the depth of suspicion and mistrust between the Afghan president and his Western partners, at a time when 30,000 new U.S. troops are flooding into Afghanistan to join the 100,000 foreign troops already there, and the Obama administration is depending on Karzai to help fend off the growing Taliban insurgency. The health-care debate has generated intense levels of frustration among the bill's opponents, and those who say they are outright angry almost universally believe that the country is going in the wrong direction -- some say toward an America they no longer recognize. Of the 26 percent of people who described themselves as "angry" about the new law in a recent Washington Post poll, virtually all also said the country was on the wrong track. In follow-up interviews, many went beyond health care as they spoke of their deep misgivings about the country's leadership and the changes taking place around them. "I grew up in the '50s," said Hugh Pearson, 63, a retired builder from Bakersfield, Calif. "That was a wonderful time. Nobody was getting rich, nobody was doing everything big. But it was 'Ozzie and Harriet' days, 'Leave It to Beaver'-type stuff. Now we have all this MTV, expose-yourself stuff, and we have no morality left, not even by the legislators." Pearson and others described a rising concern about illegal immigrants who they say fill hospital emergency rooms and drain public resources. In the follow-up interviews, they expressed a distrust with a government they believe is taking from the many and giving to the few. Nearly nine in 10 of those who are angry about the health-care bill say it represents a major and negative change for the country, with some interviewed after the poll saying they believe the country is moving toward socialism. Tricia Farmer, 42, a pension administrator in Glenville, N.Y., said she is a Republican and a fiscal conservative who worries about the creeping expansion of the federal government. At the same time that Congress appears to be increasing spending, her own local school district is facing budget cuts. She worries about the world her elementary-school-age children will inherit. "What I worry about is that they aren't going to have the choices that we had," she said. "There are going to be mandates for everything. Mandates and taxes, more and more, a heavier burden on them. I'm feeling we're headed toward a socialist society, and I feel that it's not going to be reversible if it keeps going the way that it is." In the late-March poll, the "angry" population overlapped generally with those who identified as Republicans. They were overwhelming white (94 percent) and conservative (73 percent). Many of those who listed themselves as "angry" said they felt Congress was operating in a vacuum, removed from the problems encountered by average people struggling against a tepid job market, sagging home values and dwindling retirement funds. About 85 percent strongly disapproved of the way Congress is doing its job. Much of the language echoed that of the vocal, conservative "tea party" movement, as well as conservative talk radio and blogs. "The tea party activists represent Middle America. They are the hardworking Americans who see their country eroding in front of their eyes," said Chris Domsch of suburban Kansas City, Mo. He said he is an independent but has never backed a Democratic presidential candidate. A few voted for President Obama in 2008, such as Chris Lionette, 43, who works in employee relations at a company in Holmdel, N.J. He said he believes the health-care bill is deeply flawed. "I think it was done for political reasons, that it was done in a rather hasty fashion, and in my opinion there are other issues facing this country we need to be addressing," Lionette said, naming immigration and the wars in Iraq and Afghanistan. Karen Hamrick, 63, said her southern Kentucky town of Hopkinsville hasn't been the same since Flynn Enterprises closed a jeans-making factory nearby in 2004. Nearby Fort Campbell provides a jolt to the economy, but only when its soldiers are there, the retired dance teacher said. When they are deployed, many of the families pack up and head home, too, she said. Though she is a registered Democrat, she considers herself a "Southern Democrat" and believes the health-care bill will rob the majority in a misguided effort to help a small number of disadvantaged people. "It's not realistic. It's very idealistic, and if we lived in that kind of world it would be wonderful," she said. "But where it's left is in our back pockets." If we don't solve the country’s looming fiscal catastrophe and in the process save the country, it’s the decline of Rome. Americans have grown complacent and careless. For 200 years, they lived precarious lives. There were boom and bust economic cycles, devastating epidemics and natural disasters that came without warning. These conditions instilled a sense of prudence. The thought of running up excessive debt filled them with moral horror. But over the past years, life has become secure. This has eroded the fear of debt, private and public. In 1960, the nation’s personal debt amounted to 55 percent of national income. By 2007, it had risen to 133 percent of national income. In 1960, a politician would have been voted out of office if he had allowed the federal debt to double in a decade. Now politicians are likely to get voted out of office if they try to prevent it. These days, voters want low taxes — about 19 percent of G.D.P. And they want high spending — over 25 percent of G.D.P. by 2020. As a result, federal debt, which stood at 41 percent of G.D.P. two years ago, is forecast to balloon to 90 percent of G.D.P. in 2020, according to the Congressional Budget Office. By that time, interest payments on the debt alone would be $900 billion a year. President Obama has signed off on new security protocols for people flying to the United States, establishing a system that uses intelligence information and assessment of threats to identify passengers who could have links to terrorism, a senior administration official said Thursday. The new approach will replace a broader layer of extra scrutiny that had been imposed recently on all passengers from 14 countries, most of which are Muslim. “It’s much more tailored to what intelligence is telling us and what the threat is telling us, as opposed to stopping all individuals from a particular nationality or all individuals using a particular passport,” the administration official said Thursday, speaking on the condition of anonymity in advance of the formal announcement. The intelligence-based security system is devised to raise flags about travelers whose names do not appear on no-fly watch lists, but whose travel patterns or personal traits create suspicions. The system is intended to pick up fragments of information — family name, nationality, age or even partial passport number — and match them against intelligence reports to sound alarm bells before a passenger boards a plane. Texas Republican Sen. Kay Bailey Hutchison has gone back on her pledge to resign her seat and instead will serve out the remaining two years of her term. Hutchison's decision comes roughly one month after she was badly bested by Gov. Rick Perry in a primary fight that was once seen as hers to lose. During that campaign, Hutchison repeatedly pledged that she would resign her seat in the aftermath of the primary -- win or lose. 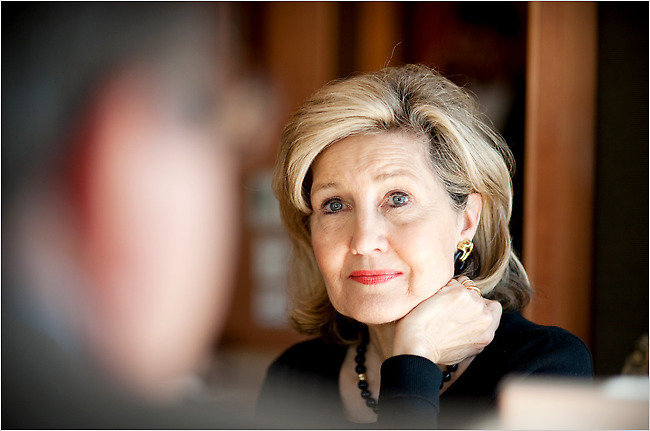 Smart political operatives, however, were always skeptical that Hutchison would step aside if she lost and, as primary day drew closer and it became more and more apparent she would come up short, conventional wisdom congealed around the idea that she would ultimately go back on her word for two reasons. First, resigning her seat in the wake of a loss would be an unsatisfying end to a political career that some believed might ultimately end in the White House. Hutchison entered the race against Perry as the most popular politician in the state but left it with much of that shiny veneer rubbed off. She can now use the next two years to rebuild that image and burnish her legacy. Second, if Hutchison did resign, Perry would have the ability to choose an interim successor who would then almost certainly have a leg up in the special election to serve out her remaining two years. The idea that the person who had just all-but-ended her political career would also be able to pick her replacement was an unsavory one that Hutchison almost certainly wanted to avoid.